This mega mushroom was growing in the same place as I found the parasols (see previous post), but it's stem was massively swollen. 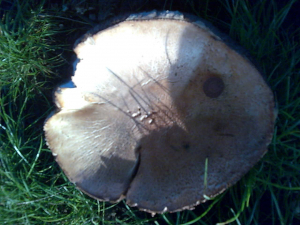 There weren't any other fungi around, so I thought it might be a mutant parasol? The stem definitely had a ring, even though it was stretched to breaking point! in cap photo, there is a penny just about visible for scale.